The XS sights DXT standard dot are Defensive night sights for encounters under any light condition. 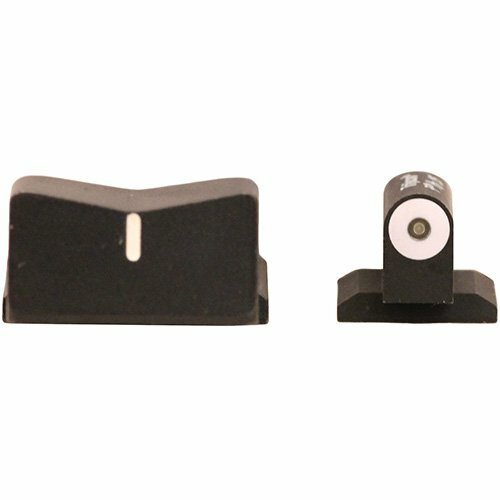 The Express rear sight features vertical green tritium bar with a highly visible, white outline. The front sight has a large, easy-to-see white ring surrounding the tritium dot. ROUNDED, low profile design won't slow your draw and works with the majority of holsters on the market. Designed to directly replace the factory sights. Features:- larger front sight improves the speed of front sight acquisition- white dot reflects light for best visibility in low light- Express rear prevents obstruction of front sight when moving- snag-free design for comfortable carry- green specifications:- sight set- fits: Walter 99, PPC, saw 99- file to fit installation (no sight Pusher tools)- front sight: white standard dot with green tritium center- rear sight: green tritium with white outline- material: blued steel- finish: matte black- includes: hardware kit""
If you have any questions about this product by XS Sight Systems, contact us by completing and submitting the form below. If you are looking for a specif part number, please include it with your message.